The story behind "Globalisation 3: Tibet"
Tibet may be occupied by China and therefore officially anti-capitalist, globalised brands are everywhere. This little kid on the streets of Nyalam is wearing a Nike sweater, but one that will likely never have appeared in one of the official catalogues. It’s interesting to think that many of the cool clothes are cheaply made in Asia, some of them by small children, while they are sold for big prices in the west, so bigger children can be cool over here. But here in Tibet it works the other way, the carefully branded Swoosh is pirated and abused for very cheap clothes, so for little money these poor children can try to get the same cool effect.. Though they will not have the slightest idea what cool actually means besides not too warm.. 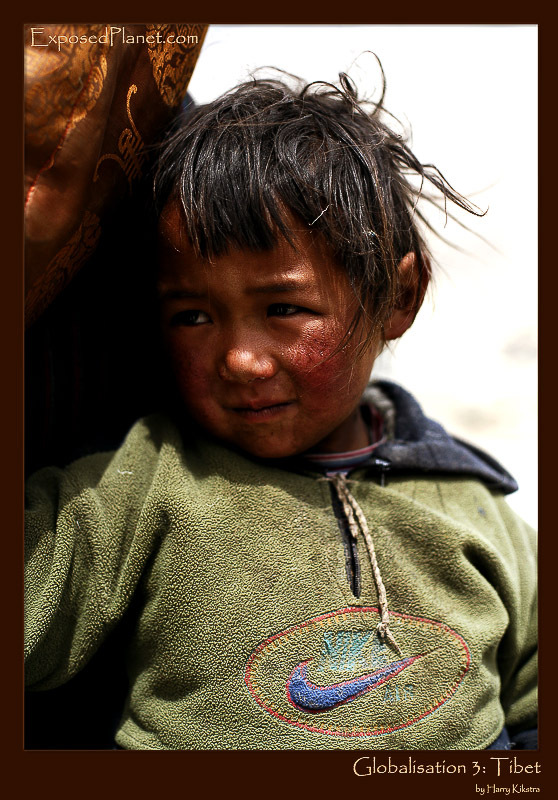 This kid was hiding away behind his mothers dress when a strange bunch of people -our everest team- appeared..